This park has tennis courts, a playground, restrooms and a water fountain. 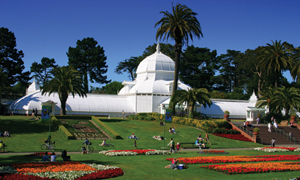 It is owned by the San Francisco Recreation and Park Department. 6-Parnassus -- Quintara and 14th Avenue. Follow 14th Ave north (it's uphill) to Radio Terrace. Walk along Radio Terrace - it becomes Rockridge Drive - to the park entrance at 12th Ave.
66-Quintara -- Quintara and 15th Avenue/Fanning Way. Climb steps to 14th Avenue, and follow 14th north (it's uphill) to Radio Terrace. Walk along Radio Terrace - it becomes Rockridge Drive - to the park entrance at 12th Ave.